If you have Mars in Aquarius, your energies are expressed in unique and original ways. There may be genius shown in the way you go about things. You are inventive, scientific, a bit eccentric, unconventional and perhaps a bit rebellious. Working with others to get things done appeals to you. You enjoy taking part in sociable, group activities and unite with others of similar ideals and persuasions. You are progressive, democratic and you are not concerned with hogging personal power or having authority over others. You are a team player. New and unusual methods of work, planning and technology appeal to you. Your energy levels are usually high, but they can be erratic at times and you may find a tendency to work in spurts. Thus, you can be impatient and inconstant in pursuing your desires. You are intellectual, cautious, independent, freedom-loving and enterprising. You respond well to emergencies. There may be interests in mechanical or scientific subjects. Science fiction may intrigue you. You may need to control a radical or rebellious streak within and remember that in certain cases haste does make waste. On the negative side you can be too aggressive, quarrelsome, contentious and perverse. 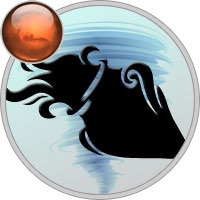 With Mars in Aquarius your energy and drive to achieve tend to be independent, unconventional, aggressive, enterprising, erratic, and alternating between extremes of activity and sloth. Your sexuality is also this way, with an interest in experimenting as well. If your Mars is afflicted, you can be argumentative, stubbornly contrary, belligerent, and impatient. You are thorough in planning ahead and covering all the angles when it comes to your ambitions. You tend to be a reformer, and enjoy working with organizations or in community projects.